I am a priest of ___, ordained now about a year and a half. I have been a regular reader of your blog since college, and I wanted to write you about an interesting experience I had the other day saying Mass. I learned the Extraordinary Form in seminary, actually the semester before the practicum in the new rite. I joke that I’m one of the rare priests under the age of 70 who learned the old before I learned the new. I usually offer a low Mass about 2-3 times a week, on the days when I don’t have a public Mass. The other day, I went into the chapel to say Mass, and it had been a very long and tiring week, and I couldn’t really think straight. It had also been a few weeks since I’d been able to offer the EF Mass, as I’d been traveling a lot and my “mobile sacristy” does not as yet contain Extraordinary Form capability. I usually offer the OF in Latin when I travel, including on the great altar my brother built to put in my room at my parents’ house. In any event, I found that even though it had been a few weeks, and even though I was very very tired, the rite just came back to me, just as natural as can be. I stumbled a bit on the pronunciation of the readings, being a bit out of practice, but other than that, I was able to just start the Mass and hang on, and it all came right back out again. It’s just a beautiful comfort for me of how much we can keep within us, how those words that give us access to God so intimately are always right there for us. I think about something I told the first communion kids the other week, when their teacher asked me to tell them why learning their prayers was so important. I told them about the elderly folks I sometimes visit who don’t remember anything or anybody, but the moment I start saying the Our Father, they join right in. It stays with you, the gift of prayer the Lord gives us. I suspect that when I’m ancient and barely know my right from my left, I’ll still know my rites, and all it’ll take is that first Introibo to bring it all back. God bless you and your work, Father! First, I am encouraged at your story. You have it now in your marrow. That means that it is thoroughly yours now. It is shaping you as a priest from within. So many times I have encountered people who perhaps have not practiced their faith for many years but, when queued, they still know their prayers and catechism that they were required to memorize as children. It is still within them, waiting to burst out. I am reminded of the way that priests who were to go into Russia during the long Communist nightmare memorized Mass formularies just in case. After breakfast, I would say Mass by heart–that is, I would say all the prayers, for of course I couldn’t actually celebrate the Holy Sacrifice. I said the Angelus morning, noon, and night as the Kremlin clock chimed the hours. Before dinner, I would make my noon examen (examination of conscience); before going to bed at night I’d make the evening examen and points for the morning meditation, following St. Ignatius’ Spiritual Exercises. Every afternoon, I said three rosaries–one in Polish, one in Latin, and one in Russian–as a substitute for my breviary. After supper, I spent the evening reciting prayers and hymns from memory or even chanting them out loud: the Anima Christi, the Veni Creator, the Salve Regina, the Veni, Sancte Spiritus, especially the Dies Irae and the Miserere–all the things we had memorized in the novitiate as novices, the hymns we had sung during my years in the Society, the prayers I had learned as a boy back home. Sometimes I’d spend hours trying to remember a line that had slipped my memory, sounding it over and over again until I had it right. During these times of prayer, I would also make up my own prayers, talking to God directly, asking for His help, but above all accepting His will for me, trusting completely to His Providence to see me through whatever might lie ahead. This entry was posted in SESSIUNCULA and tagged Fr. Walter Ciszek, memorization. Bookmark the permalink. Your young priest’s account brings tears to my eyes, and the same for the priest’s story of being in Russia. The very first thought I had while reading these words was that I wish all priests could be exposed to stories such as these, and then they would appreciate the Holy Mass more and the freedome they have now. Some day when God opens all our eyes to our failures, those priests who offer Mass irreverently will be horrified. There is a priest in residence at our church, while he teaches a class at my “once Catholic” Alma Mater in town. Every Mass of his causes me such spiritual pain as it is all “horizontal” rather than “vertical”. Words are changed, the sign of peace is a circus even at the altar…….. I just offer it up, but long for the reverence we have lost. To those priests who are still holy, as many of you are, my heartfelt thanks and prayers for you. You will have your reward in Heaven even if you don’t have it on earth, especially if you are persecuted now. Mother Mary, cover all your priest sons with your mantle and keep them safe from evil. God bless you Father Z! With God in Russia is a great book and very inspiring without actually being written as a spiritual book. It was written discussing primarily Fr. Ciszek’s exterior experience in Russia. He has another one, which I’m currently reading, titled, “He Leadeth Me” which discusses his internal experiences while in Russia. It’s hard to believe how far the Jesuits have fallen from where they used to be. St. Francis Xavier’s forearm is currently in my city, and I will make a trip today to go venerate it and ask for St. Francis’ intercession for the Jesuits and Pope Francis. Brother, I rejoice with you that you have so quickly come to this realization of how completely the Mass informs our life as priests. This is true of the Mass in all of it’s forms, but the amazing continuity of words and gestures in the forma antiquior helps us to get “by heart” more deeply, more quickly, since it demands our complete submission to the ritual. The fact that you offer Mass every day is tremendously important to growing in your priestly identity, and you are wise to offer daily Mass even when not duty bound to do so. But I have to admit, in this day and age of priest shortages, I don’t understand how it can be that 2-3 times a week, you don’t have a public Mass. I pray for you that, as you go forward in your priestly ministry, you have more opportunity for the public celebration of Holy Mass without losing your opportunities for the forma antiquior. If you memorize your prayer rule, the prayers are always with you. You don’t have to flip through a book. You don’t need a book. If your eyes go bad, you can pray. You can pray in a dark church. If you can’t sleep at night you can pray from memory until you fall asleep. You can pray while you are walking or while you are waiting. You can pray while you are getting a root canal. Also, both of Father Ciszek’s books are a must-read for every Catholic. They are astounding in their account of the heroism required to endure what Father suffered for many long years in Russia in order to bring the Catholic Faith to those living under the oppressive regime at the time. He also gives an account of the remarkable grace he received when he was being subject to grueling interrogations intended to break him, and how God brought him through that with an extraordinary grace. If only todays Jesuits would take cues from Fr. Cisezk, then they wouldn’t be so far left of center no? This reminds me of many war movies where men assist the likely mortally wounded in reciting their prayers. At our homeschool co-op, we teach the students the Our Father, Hail Mary, Glory Be, and grace before meals in Latin. The students usually have them cold by the end of their first semester with us. Today, a student who was with us only one year (2015-16) came to visit my children. After almost two years since she attended the co-op, she nailed grace before dinner in Latin! She will always have those prayers as hers. Immaculee Ilibagiza, the Rawandan genocide survivor, prayed the Rosary and Chaplet of Mercy from morning until night when she was hidden from the butchers for 91 days. Those prayers not only helped her keep her sanity, they also helped preserve her life and lives of the others who were in hiding with her, as Jesus appeared to her more than once and demonstrated. So many times, when we have no other reserves, memorized prayers are the greatest gift. I’ve read both of Fr. Ciszek’s books about Russia. 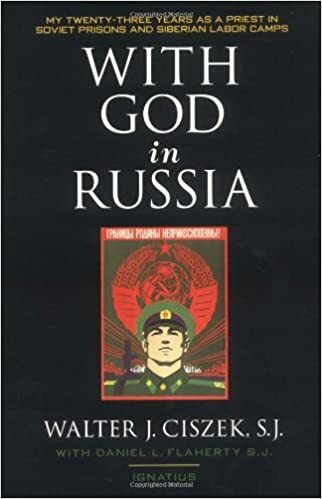 With God in Russia is a great autobiography of his experience. He Leadeth Me is a great spiritual reflection. Another consideration is that Fr. Ciszek may have been celebrating the Divine Liturgy with all eight tones, adding a whole other layer of complexity to his work of memorization. My four year old daughter has the Our Father, Hail Mary, Glory Be, Apostles’ Creed, Hail Holy Queen, Guardian Angel Prayer, Grace Before Meals, and all of her Mass parts memorized. This really isn’t hard (learning or teaching)! She’s four! We just practice a little bit every day. Fr. Ciszek’s story reminds me of a Jesuit friend of mine, age 88. I took him to a Tridentine High Mass last November. After the Mass, he was telling me how he still remembers all the prayers in Latin. He was born and raised in Intramuros, Manila before the Japanese invasion, which was practically the heart of Hispanidad and Catholicism in the Philippines (its destruction in 1945 is a factor to the current mess of ‘inculturation’ and lukewarm liturgies the Church in the Philippines is faced with). He was a regular altar boy in the church of the Franciscan monastery, both now gone sadly. Ordained at the time between Pope John XXIII’s death and Pope Paul VI’s election, he still memorizes how to celebrate the Tridentine Mass and many of the pre-Vatican II prayers. Once, he even asked me if I’d be all right if he gave the blessing after confession in Latin, which I obliged. I imagine that things like these become second nature eventually, especially for clerics. That’s why I wonder why a number of priests, when saying the prayers during Mass, still read to this day from the Missal even when they’ve been doing this (I’d like to assume) on a regular basis. They do indeed become “second nature”. Hopefully many of the prayers were already so before our ordination as we will have lived the life of the Church with daily Mass and frequent reception of the Sacraments for years. But don’t be surprised when we follow the Missal so closely. This is one of the best ways to ensure that we submit ourselves to the ritual. Even if we know the words, we are to follow in the Missal lest we make mistakes — even small ones are to be avoided as far as possible. Reading from the Missal a prayer that I know by heart is a way in which I submit myself daily to the order of the Church rather than to my own efforts. We priests thank you for your continued prayers for us as we offer Our Lord’s Sacrifice for you all daily. Great email from that priest, post, and book. God bless our priests. Great comments. And to think that I had to have an argument with my confrère because we are going to sing the Agnus Dei during Lent, even though it was presented by Father at the planning meeting as a fait accompli. Just wait until he finds out that I’m teaching the Pater Noster to the ten-week apologetics discussion group I’ve organized with the DRE, who thought both were good ideas. He may never forgive me. Another Jesuit mentioned favorably on these pages? Spring has come early this year! 10 years ago, I taught CCD for a half-dozen fourth graders who, having already made First Communion and having done their First (and, let’s be real, probably only,) Confession, didn’t even know the Our Father, the Hail Mary, or the Glory Be! I wrote a gentle note home that I expected the kids to learn these three prayers, and in pitching it to the kids themselves, I mostly made the points made above, “Instead of scrambling to remember a prayer in high school, they’ll just BE there in your brain,” etc.